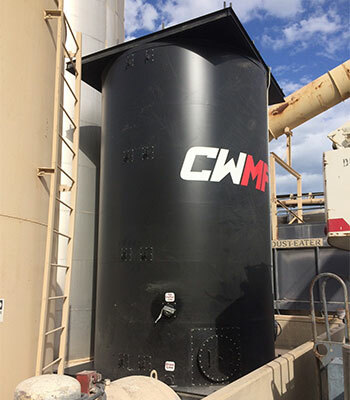 Vertical storage tanks are used when increased efficiency and space constraints are a concern at your HMA facility. You can effectively place 3 to 4 tanks in place of 1 horizontal tank. 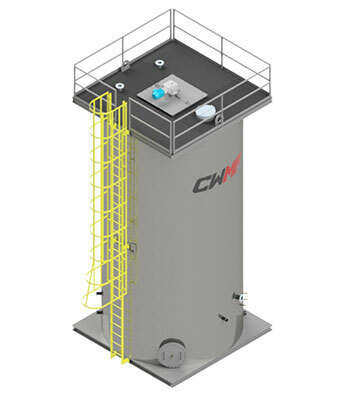 Compared to a horizontal tank, a vertical tank has a much smaller surface area in contact with the air. This minimizes oxidization of the AC. An OSHA-approved, caged, safety ladder and hand railing are supplied with all our tanks. We also offer a range of options for customization. Our tanks are constructed from 1/4″ material that is bevel prepped to ensure 100% weld penetration. We also incorporated a square top and bottom base. The bases are constructed of 6″ channel and are insulated with 6″ rigid fiberglass insulation. The top platform provides ample access space and provides for a simple connection to adjacent tanks. The insulated base platform significantly reduces heat loss in the AC as you eliminate the heat sink into the ground. The square base platform also provides for convenient mounting of controls. Our sidewalls are insulated with 4″ rigid fiberglass insulation as a standard. Our tanks are sheathed with an aluminum cover. This can be supplied in several color options or aluminum finish. We use 2″ – A106 seamless pipe for our coils. Our coils are tested at 125 PSI and held at pressure for 24 hours. 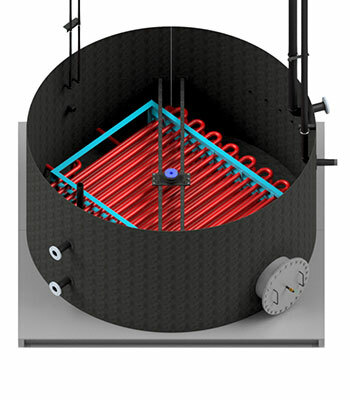 The piping layout of the tank is built to suit the customer’s needs. 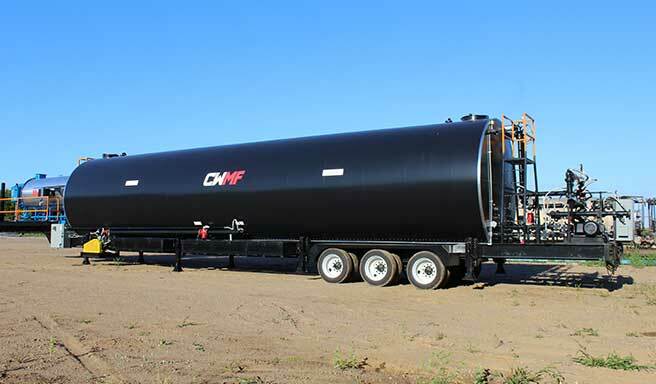 Whether we are adding a tank to an existing group or providing a new tank farm, we will work with you to meet your demands. Our tanks are constructed from 1/4″ material that is bevel prepped to ensure 100% weld penetration. We use 5/16″ thick material on the heads. Our tanks are insulated with 3″, dense foil-backed insulation. We also insulate the under carriage, providing a 360º insulated vessel. Our tanks are sheathed with an aluminum cover. This can be supplied in a natural finish or in several color options. 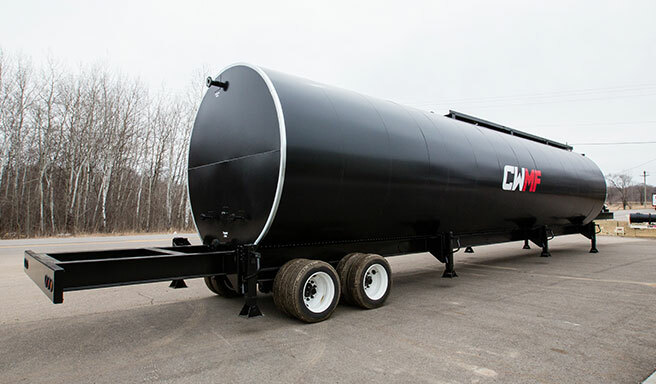 Our portable tanks are built to hold up to the conditions of moving them from pit to pit. We incorporate a heavy duty I-Beam under carriage and the necessary space needed for storage containers for hoses, etc. We also mount individual leveling jacks along the length of the frame to ensure proper support when in operation. 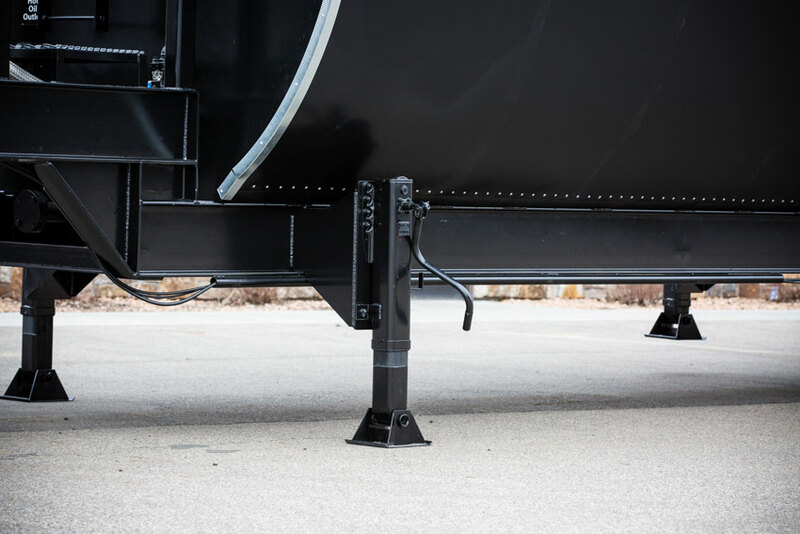 Tandem or Tri-axle suspension kits are supplied with fenders and mud flaps. The piping layout of the tank is built to suit the customer’s needs. Whether we are adding a tank to an existing group or providing a new tank farm, we will work with you to meet your demands.